Markets are off to a positive start this week as investors gear up for a flurry of earnings from big names, starting with Citigroup on Monday. 1. Germany celebrates: The DAX index is the strongest gainer in Europe early Monday, up 0.8%. Germany has captured its first World Cup in 24 years, beating Argentina in Sunday's final. U.S. stock futures were 0.3% higher. 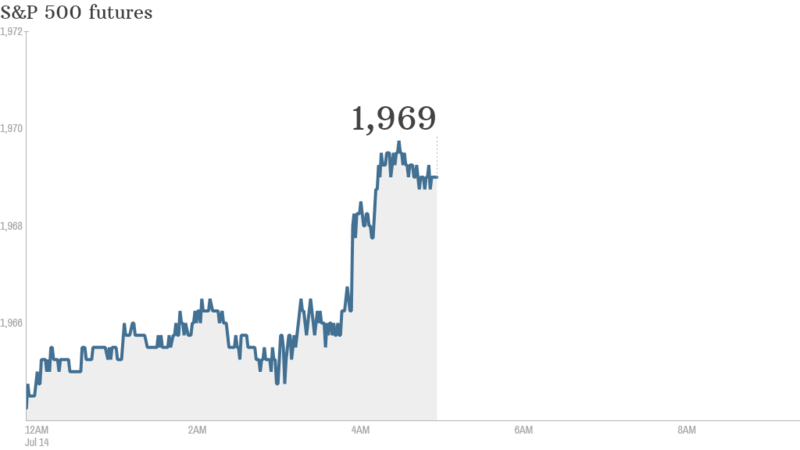 Asian markets were also mainly positive, tracking Wall Street's firmer close Friday. The Nasdaq added nearly 0.4%, while the Dow Jones Industrial Average and S&P 500 both gained about 0.1%. Despite losses earlier in the week, the S&P 500 and the Dow are still trading near all-time highs. Experts surveyed by CNNMoney expect the S&P 500 to be even higher by the end of the year. Related: Will earnings express lift Dow above 17k? 2. Citigroup in focus: Citigroup (C) will report earnings before the opening bell. It may also announce a $7 billion deal with U.S. regulators to settle charges related to the sale of bad mortgages during the run-up to the financial crisis. 3. Big pharma tax deal: AbbVie (ABBV) has won the support of the management of Shire (SHPG), a London-listed drugmaker, for its improved £31 billion ($53 billion) takeover bid. The deal should allow AbbVie to move its tax base to the U.K. , under a process known as "inversion." Pfizer (PFE) tried but failed with a similar approach earlier this year to AstraZeneca (AZN). 4. Tech stocks perky: Tech stock could be the stars of the earnings parade this week and some big names were moving premarket Monday. Apple (AAPL) and Facebook (FB)were both up by about one percent, while Amazon (AMZN) and Google (GOOG) posted slightly narrower gains. 5. Economic data: China's economy is in danger of missing its growth target as risk balloons in the country's real estate sector, according to a CNNMoney survey of economists. China is due to publish second quarter GDP data on Wednesday. Meanwhile, the Census Bureau will report U.S. retail sales from the month of June at 8:30 a.m. ET.